1. Wash and cut the potato into 4 pieces. 2. Pressure cook them along with little water and salt for a whistle in high flame. 3. Allow it to cool down. Then peel and cube them. 4. Chop the onions into thin and lengthwise pieces. 5. 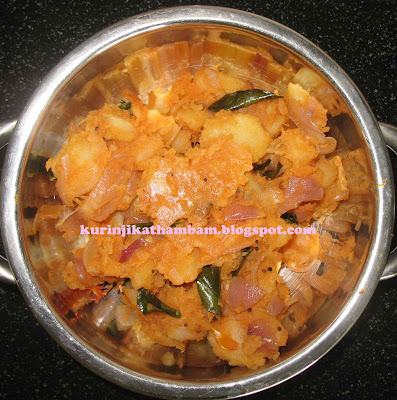 Heat the oil in a pan, add cinnamom, curry leaves and chopped onion. Fry till the onion turns into golden color. 6. Then add the chopped tomato, red chilly powder and salt. Fry for a minute. 7. Then add the cubed potatoes and sprinkle water if necessary. 8. Stir well and cook for 5 mins. Serve with Rasam Rice or Curd Rice. Delicious looking stir fry.Good with chapati. All time classic poriyal! Love it with sambar sadam! It looks very tasty. Yummy. Potatoes are one of my fav veggie and that looks yummy! perfect with some hot rotis. yummy and simple curry !!! u r right- with rasam rice this sure would rock !